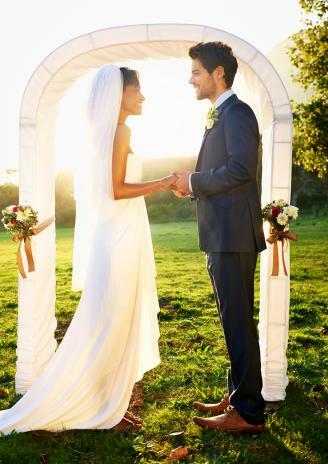 An arch is the focal point of your ceremony, framing you as a couple as you exchange vows. 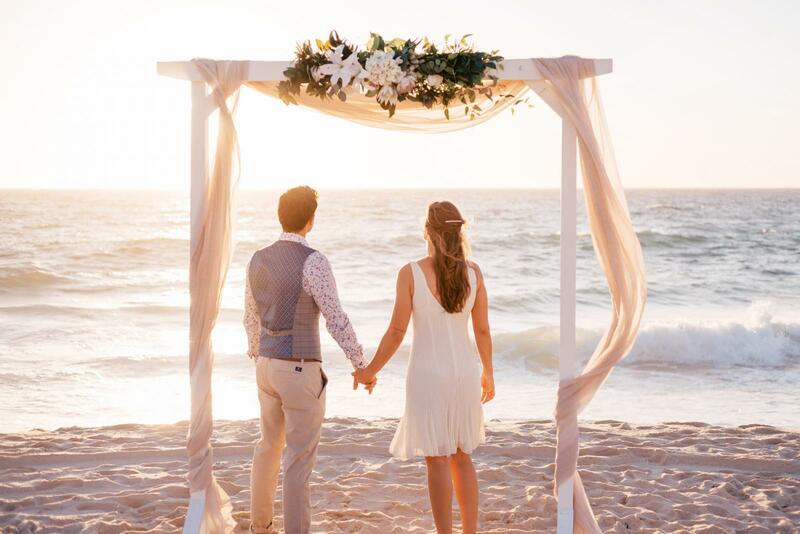 Beautifully decorating your wedding arch can set the tone for your entire event, and there are lots of ways to do it creatively. You don't need an elaborate floral arrangement to give your arch a beautiful look. 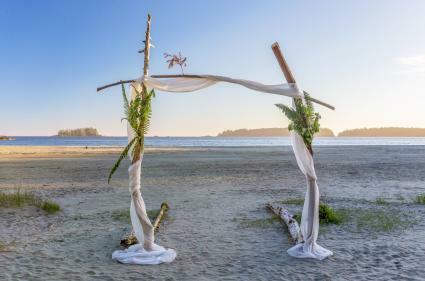 If you're having a beach wedding or other casual outdoor event, a less complicated design lets you take center stage. Start with a simple floral swag in the center of the arch, either in your wedding colors or in white. Then add about five yards of tulle fabric, available at any craft store. The tulle can blow in the wind and add even more natural loveliness to your wedding. Indoors or out, another great option is to wrap the entire arch in fabric. This makes it feel more substantial, and it's a great way to add beauty to an arch that might not be to your personal decorating tastes. The amount of fabric you need will depend on the size of the arch, but it will be at least 10 yards. You can choose any color that works for you and get great deals by watching sales at fabric stores. Simple start at the middle and wrap the fabric around the arch, pinning to secure it. Add bouquets or ribbons to either side for a pretty touch. You don't have to rely on white tulle to decorate your bridal arch. Another great option is to use colorful flowers and paper fans. This is a fun, playful choice that shows real creativity and style. Choose large blooms for maximum impact, such as big hydrangeas or peonies. Buy the fans online at places like Oriental Trading Company. Wire the flowers and fans to the frame of the arch using floral wire in a color that matches the arch itself. 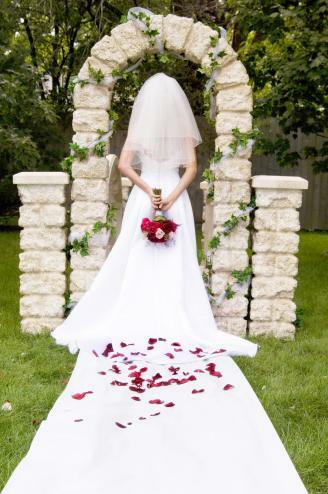 Experiment by adding smaller blooms, ribbons, or greenery to give your arch a custom look for your wedding. For a non-traditional, yet colorful, option, consider decorating your wedding arch with berries. This is especially great for a fall or winter wedding when berries are part of regular floral decor. You can buy garlands and sprays of colorful berries at craft stores. Choose any color that works for your event. Simply wrap the arch in berry garlands and then add larger sprays of berries for more impact. Make some decorative bows in matching ribbon to bring in more color if you wish. It can be a challenge to figure out how to decorate an existing stone arch, since the arch itself is substantial and makes a difficult surface for attaching decorations. The key here is to wrap the arch in beauty. Buy tulle fabric at your craft store, and use real or artificial flowers to create a simple garland. Starting at the center of the arch, wrap the tulle and garlands down both sides. Keep the wrapping taught enough to stay put but spaced to allow the natural beauty of the stone to shine though. For a rustic wedding arch, use simple greenery and flowing chiffon to add beauty. Chiffon flows in the wind and is ideal for an outdoor event. Make sure you secure it well at the corners of the arch so it doesn't blow off entirely. Add neutral greenery like ferns or ivy to keep the arch look natural and simple. You can attach the greenery with floral wire to keep it from being disturbed by the beach or garden breeze. Decorate your arch with fairy lights for a magical evening wedding backdrop. 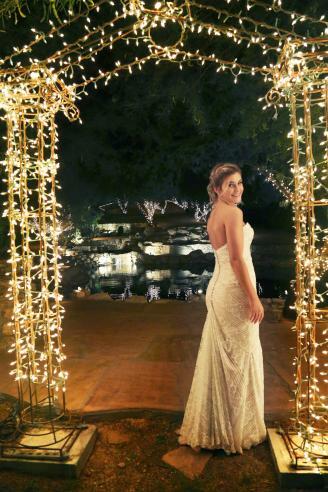 The glow will help light your ceremony and add incredible ambiance to your event, and this is a very easy look to achieve. You'll need lots of strands of simple white fairy lights or twinkle lights. Start at one side and begin wrapping them evenly until the entire arch is covered. Be sure to plan for an extension cord and electrical outlet to power the lights. No arch handy? No problem! 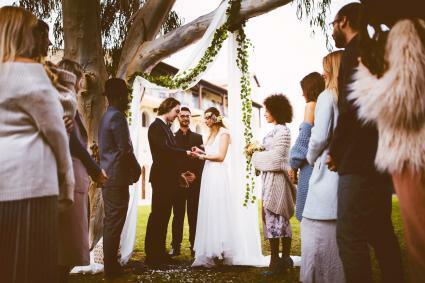 You can make your own wedding arch by draping fabric and greenery over a large tree branch. This is a wonderful touch for a backyard or garden wedding, and it also works if you're getting married in a rustic location where you need to bring your decorations with you. Simple bring several yards of white fabric and some pretty vines or garlands. Drape them over the branch so some trails on the ground. Take some time to look at pictures of wedding arches and plan what you would like for your own event. Whether you want something super simple and rustic or a bit more elaborate, there's a perfect bridal arch design out there for you.